Since I am 8 and a half months pregnant, I wanted a costume that would highlight my belly. I suddenly remembered the cute little big-bellied dolls I had as a kid: Treasure Trolls! 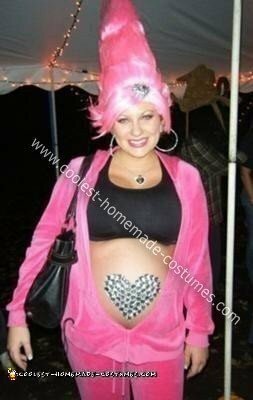 For this Homemade Treasure Troll Pregnant Costume I bought a pink troll wig online. It came with a purple heart gem on the hair part, which I did not like, so I covered the gem by hot-gluing fake diamonds onto it. I kept the heart shape but just changed the color. I cut a heart out of a piece of skin-colored felt. I chose felt because it moved and lay better on my round belly than paper. I hot-glued all different sizes of fake diamonds until the heart was completely covered. I used double sided tape to attach the heart treasure to my belly. Being pregnant and wanting to be comfortable, I wore a pink maternity sweat suit with just a sports bra underneath. I attached earrings to my fake troll ears, put on hot pink eyeshadow and lipstick and even wore pink contact lenses! where did u get ur wig? i want to be a treasure troll this year, but im having a hard time finding one as cool as yours.